You'll love seeing the toddler in your life benefit from the beauty of Amish craftsmanship. Our Amish Hardwood Post Type Highchair with Slide Tray and Wheat will add a decorative element to your kitchen or dining room while also being incredibly functional. This highchair is handmade with care in solid oak wood. Its standard stain is medium walnut, but it can certainly be ordered any way you like! Featuring a unique wheat inlay at the crown, this aspect will bring the beauty of the great outdoors into your home. 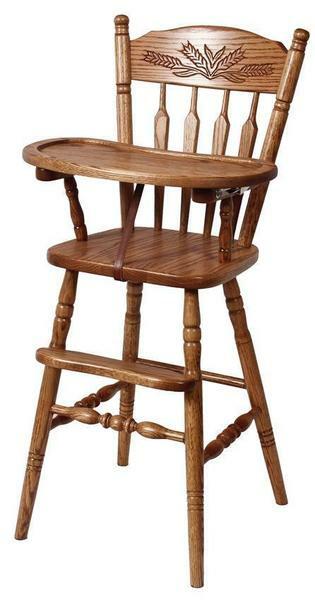 It reminds us of the gorgeous Indiana Amish Country where this highchair is handcrafted. Its convenient foot rest will keep children comfortable as they grow. Supportive back splat will make sure they are at ease during mealtime. Please feel free to get in touch with any questions you have about this American made highchair: 866-272-6773.